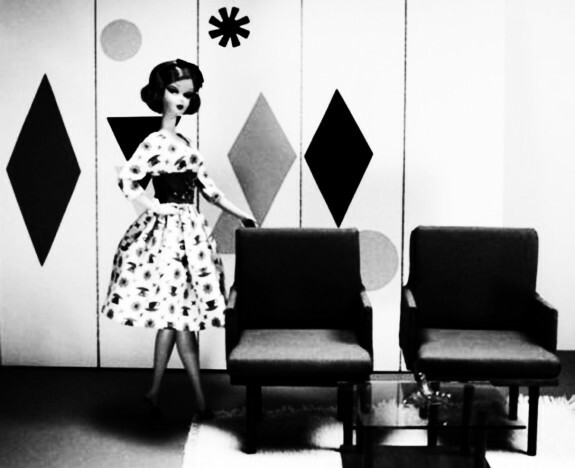 Mad Men may well have been a form of mod/modernism for grown-ups – this was a world of childhood toys for grown-ups. Essentially, a whole mini-cultural genre of sharply styled, populuxe-esque Barbie dolls and home made (but far from home made looking) accessories. I don’t know if this was before, after or a similar time to when I was discovering David Levinthal’s diorama and Barbie based work but it put me in mind of such things but arriving from a more homespun, less fine art base. One of my early discoveries was the “official” side of such things – the Joan Harris of Mad Men Barbie doll released by Mattel (and hence an overt connection otherly than purely aesthetic ones to the series) that can be seen at the top of this post but soon wandered into this world of handcrafted objects that summoned forth a Mad Man-esque world and its ambience. Lovely stuff. Much of the furniture, fixtures and fittings that populate this place and the accompanying outfits are often one of a kind (or ooak in modern abbreviated searching and seeking parlance). Even many of the dolls have been modified from the “official” releases. The image below of such work intrigues me. It’s part of the same series but in its style seems to harbinger the later series of Mad Men, when the sharp 1960s styling began to meet looser late 1960s/early 1970s style. Stylistically Mad Men ended at a liminal point – there had not yet been a transition from one era to another’s style. It is something that I would have been interested to see how that aspect would have developed if the series had continued through the years. There could be seen to be a connection between the affluence and opulence of populuxe styling and that of say affluent 1970s glamour but the former is intrinsically connected to a corseted (uptight? ), ideal nuclear family, genre division of home and work roles way of being or philosophy while the latter is founded more in a sense of decadence, (over?) indulgence and the like – the perfect housewife becomes the perfect playmate.